NrVissing.Net is the community driven WISP that I'm doing tech for, we are in the middle of expanding our backhaul to 80 MB/s via a 6 km, two leg, 801.11a wireless link. The new wireless link means that we will have several remote, outdoor routers that need constant environmental monitoring to ensure that condensation doesn't form and that we discover leaking enclosures before damage is done. Temperature, LM75, one local on the controller and several others off-board for various local hotspots. Voltage output of the mains powered switchmode. Voltage supply to the controller and the router. Voltage of backup battery (to monitor charging). Enclosure door switch, in case of breakin. 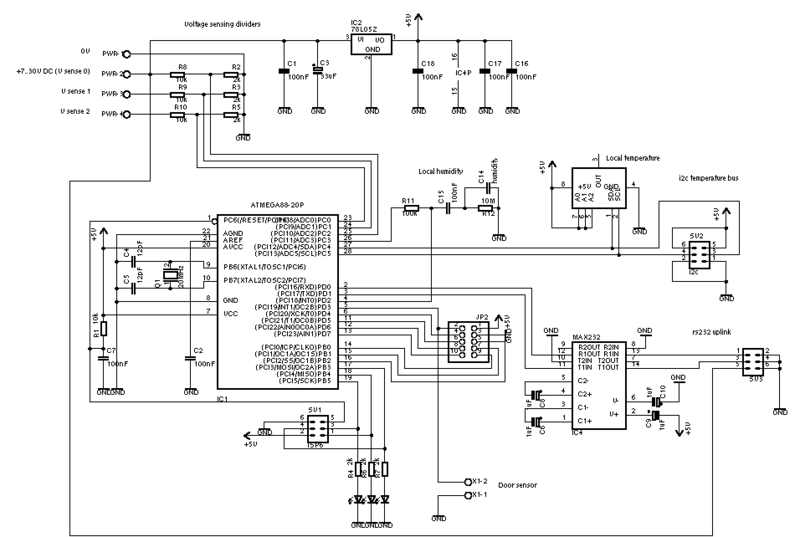 The controller will simply output all sensor values each minute or so via rs232. The unused i/o pins are brought out to a header so it's easy to expand later. The door switch will just short an i/o pin to ground, so the internal pull-up needs to be used on that pin. The ISP pins are used to drive LEDs, hopefully it's ok to do so via 2k resistors. 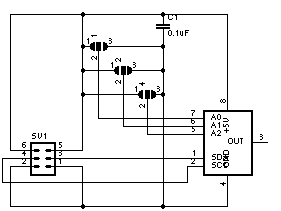 The unregulated power can also be supplied via the rs232 header, in case that's ever desired. The crystal is 20MHz, but it could probably be much slower. The size of the controller PCB is just under 5x8 cm, which means that 4 copies can fit on a euro board, should I ever want to have it fabbed at Olimex. 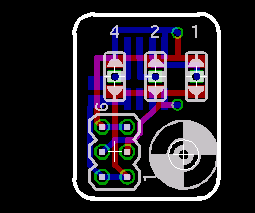 This is my first double sided layout ever and it's also the first time I use SMD components, I'm really impressed by the density that I get this way, but it will be interesting to see how it turns out. Gold Phoenix doesn't want to panelize my designs, that means that I have to combine the gerbers and drill files for my two designs into one panel that GP can do their step/repeat magic on. Before panelization can take place the layouts need to be turned into gerber and drill files, this is done mostly like Sparkfuns Eagle tutorial suggests. and I even use their silk_gen.ulp and SFE-Special.cam files. This layout means that we'll get 3 lm75 carriers per sensor controller, which turns out to be around the number we need. Review panelized layout and go back to the step needed. Send panel off to be fabricated. Others have used Eagle to create the panel, but I think this is a terrible idea as that means that going back and tweaking one layout means redoing a lot of manual work, I've found that automating the panelization work with gerbmerge to be very useful in this regard. You can read more about what I did with the layout on my Gold Phoenix vs. Olimex page. All the files used in this project are available here: sensor-ctrl.tar.gz [112K], under the GPL. lm75-carrier/jumper.lbr Modified Eagle solderjumper lib with a via in the center pad. silk_gen.ulp The silk screen generator, lifted from Sparkfuns Eagle tutorial. goldenphoenix.cam The SFE-special.cam file, lifted from Sparkfuns Eagle tutorial. 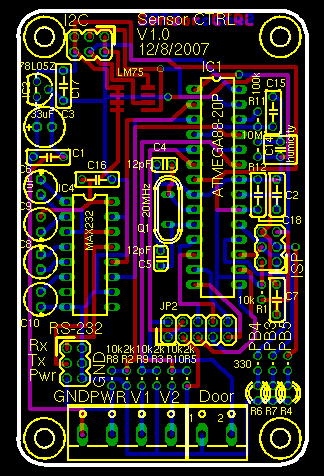 sensor-panel/sensor-lm75.layout Layout file for gerbmerge. sensor-panel/sensor-lm75.cfg Configuration file for gerbmerge, controls stuff like inter-board spacing. sensor-panel/make A simple shell script to keep the needed postprocessing commands in one place. sensor-panel/lm75-ctrl.txt The note I sent along to GP. sensor-panel/olimix.make Call gerbmerge to generate an Olimex friendly panel.